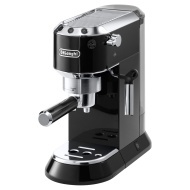 alaTest has collected and analyzed 1582 reviews of Delonghi EC 680 BK / M / R. The average rating for this product is 4.3/5, compared to an average rating of 4.4/5 for other products in the same category for all reviews. People really like the performance and size. The price and maintenance are also mentioned favorably. We analyzed user and expert ratings, product age and more factors. Compared to other products in the same category the Delonghi EC 680 BK / M / R is awarded an overall alaScore™ of 88/100 = Very good quality. The De’Longhi EC680 may not be the most affordable home espresso maker, but it sure makes strong joe that could rival more expensive models.